So you’re the travel-loving type with an adventurous streak that embraces freedom, flexibility and choice as you explore your country and the world? Adventurous You, meet Discover it® Miles(This card is not currently available on CardRatings), the 2018 CardRatings Editor's Choice Award winner for Best Travel Rewards Card Without an Annual Fee. This is one travel rewards card that offers some serious bang for very little buck – there’s no annual fee and no foreign transaction fees, but you earn 1.5 miles for every dollar you spend on the card AND, new cardholders take note, Discover will MATCH all the miles you earn during your first year as a card member. Go ahead and do that math – that means new cardholders will effectively earn three miles for every dollar they spend on the card during their first year. Look out across the travel rewards credit card landscape, and you’ll be hard-pressed to find a better-earning card than that. You can redeem rewards in any amount for travel credit or cash back. Regardless of how you redeem your rewards, it’s a simple conversion: 100 miles is always worth $1. You’ll pay no interest on purchases for the first 14 months with Discover it® Miles. Because it doesn't lock you into a co-branded airline or hotel, Discover it® Miles gives you considerable latitude in travel brand choices. And its lack of an annual fee will make you feel all the freer to jet up, up and away. Cardholders earn 1.5 miles/$1 spent and Discover MATCHES all the miles you've earned at the end of your first year. This Pro alone makes this no-annual-fee card a stronger rewards-earning contender than cards with substantial annual fees. That's why it's our 2018 Editor's Choice pick for Best Travel Rewards Credit Card Without an Annual Fee. Card members can receive $30 back for in-flight Wi-Fi fees each year, a perk that is rare among no-annual-fee cards. Miles redemption is easy – just make your travel purchase and then request your redemption in the form of a statement credit. The match the first year that effectively means you earn 3 miles/$1 is fantastic, but it ends. After that first year, it's back to the 1.5 miles/$1 rate, which is still decent but you'll definitely want to maximize your rewards earning match in the first year. 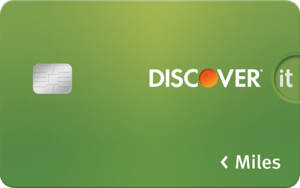 There’s a lot to like about Discover it® Miles, but knowing that Discover will match all the miles you earn during your first year for new card members – effectively meaning you earn three miles for every $1 spent – is definitely near the top of the list. That said, choosing a card based strictly on an introductory offer is rarely the best idea. The good news with Discover it® Miles, however, is that the flat earning rate of 1.5 miles for all your purchases presents a respectable opportunity to consistently rack up rewards even after your first-year match period has passed. There’s no cap on the number of miles you can earn and your miles never expire. Plus, it’s a flat-rate card which means there’s no need to keep up with tiers or rotating categories. When you want to redeem those miles, you can either request a statement credit to cover travel purchased within the past 180 days or you can redeem your miles for a cash deposit directly into your checking or savings account. Whichever option your choose, your miles are worth $.01 each – 100 miles always equals $1. Beyond offering solid rewards-earning and redemption opportunities, Discover it® Miles is also a no-annual-fee card that doesn’t charge foreign transaction fees and comes with a number of other perks that set it apart. Namely, cardholders are eligible for up to $30 in statement credit each calendar year to cover in-flight WiFi fees, a truly unique perk among credit cards in general and basically unheard of in the no-annual-fee set. Discover also boasts an all U.S.-based customer service team and has won a number of customer service awards. On top of all this, Discover it® Miles members also have the ability to track their FICO scores, free and online, and have access to Freeze it®, an anti-fraud tool that allows you to freeze your account should if you misplace your card and instantly reactivate your card when you find it. For brand loyal consumers, co-branded credit cards often represent the superior choice, but for people who prefer whimsy and spontaneity to strict planning and brand boxes, a high-earning, unrestricted travel rewards card is likely a better option. 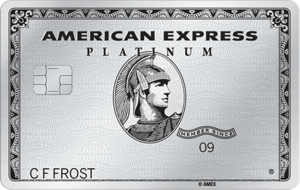 Many travel cards offer cardholders a one-time bonus in which you can earn a certain sum of miles or points after meeting an initial spending threshold when you first receive the card (for example, earning 50,000 bonus points after spending $3,000 in purchases within your first three months with a new card). Discover it® Miles is different. It all leads to a decision for anyone considering Discover it® Miles. If it's likely you will spend a great deal with your card in the first year of ownership, the matched-miles offer Discover it® Miles leads to a rich reward and can provide the rationale to apply. But if you don't anticipate buying much with the credit card in that first year, you may do better by selecting a card that features an up-front, one-time bonus. 1.5 Miles per dollar on all purchases. Chase Sapphire Preferred® Card is a tiered travel rewards card with which cardholders earn two times the points for travel and dining purchases and one point per $1 spent on all other purchases. It also offers a sign-up bonus of 60,000 points after you spend $4,000 within the first three months – a bonus that is worth up to $750 in travel when redeemed through Chase Ultimate Rewards®. 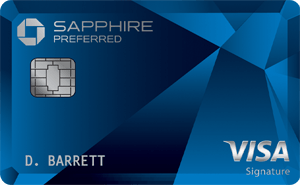 Chase Sapphire Preferred® Card, however, charges a $95 annual fee. The key with this comparison is to assess where you most often do your spending. Do you spend enough to make Disover’s “match” offer pay off or are you someone who would rather spend a few thousand dollars within the first couple of months and then reap your reward? Once your “match year” is over with Discover it® Miles, you stand to earn more with Chase Sapphire Preferred® Card if you regularly spend on dining out and travel, but Discover it® Miles is likely a better bet if you find your spending is more varied since you’ll earn 1.5 miles per $1 on all your purchases as opposed to just one mile per $1 on most purchases with Chase Sapphire Preferred® Card. One other thing to keep in mind between these cards is that Chase Sapphire Preferred® Card cardholders enjoy 25 percent more value when they redeem their points for travel via Chase Ultimate Rewards®. If you’re looking for more immediate gratification, you might appreciate the Capital One® Venture® Rewards Credit Card intro bonus offer: 50,000 miles (equal to $500 in travel) after you spend $3,000 in purchases in the first three months. That said, with Discover it® Miles, if you put all your purchases on the card it’s not hard to see how you could equal or surpass that offer thanks to Discover’s match after the first year. Similarly to Discover it® Miles, you won’t pay foreign transaction fees with Capital One® Venture® Rewards Credit Card, but you will pay a $95 annual fee after the first year. You will earn slightly more, two miles per $1 spent with the Capital One® Venture® Rewards Credit Card, but you also have that annual fee to offset. If you’re looking for simplicity and don’t want to worry about earning enough to offset an annual fee, Discover it® Miles is likely a better choice. The Bank of America® Travel Rewards credit card is quite similar to Discover it® Miles in that it doesn’t charge an annual fee and cardholders earn 1.5 points per $1 spent. When it comes time to redeem your rewards, however, Bank of America® Travel Rewards credit card holders will have to contend with differing reward redemption rates depending on whether you redeem for statement credit to cover travel or for a cash deposit into an account. There’s also a difference in terms of a bonus offers – with the Bank of America® Travel Rewards credit card you can earn 25,000 online bonus points after spending $1,000 in the first 90 days, which is a fairly low bar, but also a fairly low bonus offer worth just $250 in statement credit to cover your travel purchases. You could likely match or top that with Discover it® Miles match offer. Discover it® Miles is an excellent card for the non-brand-loyal credit card user who values simplicity along with travel flexibility. If you find yourself in the air often, you’ll also appreciate the annual in-flight WiFi credit. Do keep in mind, however, that Discover isn’t quite as widely accepted overseas as Visa and MasterCard, so plan for that accordingly. If you do take Discover it® Miles, you’ll be sure to enjoy that you won’t be facing any foreign transaction fees.